Mitchel Cohen, left, Sam's Club manager, and Keith Cronin, SunEdison Hawaii president, inspected newly installed solar panels at the Keeaumoku store. Wal-Mart Stores Inc. says the first month of operation of its solar-electric power system on the Sam's Club rooftop on Keeaumoku Street has been smooth, which bodes well for the company's pilot program here. Rows of tilted photovoltaic panels -- 1,488 in all -- on the roof are providing Sam's Club with about 15 percent of its electricity needs, according to club manager Mitchel Cohen. "This is part of the company's commitment to move toward its vision of all energy being 100 percent renewable energy," said Cohen. "And zero-waste." The Sam's Club on Keeaumoku is the first in Hawaii to get the panels. Wal-Mart stores in Mililani, Pearl City and Kailua-Kona on the Big Island are to follow sometime this year. SunEdison Hawaii of Kailiua built and installed the 283-kilowatt solar power system for Sam's Club, which it will also maintain as part of a solar power services agreement with Wal-Mart. The solar system at Sam's was turned on Dec. 31, and has been running almost a month with few problems, according to Cohen. The transition was "seamless," he said. During the first full year of production, the rooftop system is expected to produce more than 444,000 kilowatt-hours of electricity -- and reduce 7.4 million pounds of greenhouse gases over the next decade. 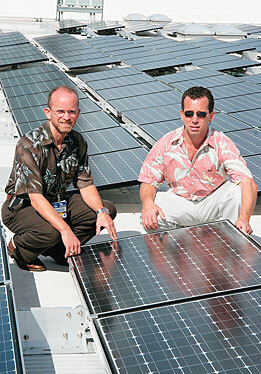 Cohen, left, and Cronin show off one of the store's 1,488 tilted photovoltaic panels. Going solar has become a growing trend among big box stores across the nation. Wal-Mart first announced plans for its pilot solar project last spring, It plans a total of 22 sites in Hawaii and California. Costco Wholesale Corp. announced in the fall that it would outfit its Kailua-Kona store with a 680-kilowatt solar electric system from REC Solar Inc., with the store on Kauai to follow. Just last week, developer MK Kona Commons LLC, a venture of the MacNaughton Group and Kobayashi Group, announced that Suntech Hawaii would install an 804-kilowatt photovoltaic system on the Big Island mall when completed this fall. Target, which will anchor Kona Commons, also announced it would go solar for all three of its stores planned in Hawaii. But Wal-Mart, which hasn't always had a reputation for being "green," first made strides towards environmental sustainability in 2005, when it announced its goals of being supplied 100 percent by renewable energy as well as to create zero waste and sell more sustainable products. The company even hired Adam Werbach, former Sierra Club president, as its environmental consultant. The Sam's club solar electric system will be hooked up to the grid for net metering, though with the big box stores' high usage, won't likely be providing extra electricity to Honolulu any time soon. SunEdison, which paid for the installation, has an agreement to sell all the energy produced back to Wal-Mart Stores. Wal-Mart will evaluate how the solar panels work at the Sam's Club on Keeaumoku before expanding further. But there is plenty of room for expansion, given that the panels only take up about half of the rooftop.